If you have removed or disconnected your car battery you will often get the ‘input code’ message on your radio. This code should be printed on a sticker on one of the manuals that should come with your car. However these often get lost and can leave you with no radio. Firstly you will need to remove the radio and get the serial number from the side of the radio. 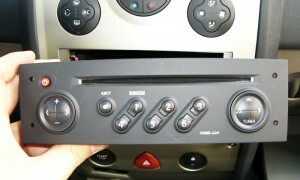 >> See video on how to remove a Renault radio. I now charge a small fee for getting your code for you. Use the button below to pay by paypal. After Payment you will be taken back to this website where you will receive your code immediately. Please enter the last four digits of you serial number. It MUST be in the form of 1 Letter then 3 numbers for example N297. Use the form below to get your code for just €2.50 inc VAT. *After Payment Please wait to be redirected to page where you will receive your code. Just bought new car radio for my Megane and replace it without any trouble, it came with it`s own code and I enter it, but now I have problem with the CD changer – it request me own code and I don`t know where I might be able to find it. The car is megane 57 reg. Hi. My four digits of bar code is w710. Can you help me with the unlock code?
. Can you give me the code? as it was already set when I bought it . Can you help with my unlock code, the four digits I have are R326 many thanks for your time! Can you help me unlock my radio. Been trying to get the code for ages and I got a code from renault that didn’t work! Hi, can you please provide me with the unlock code for my 2004 Renault Clio radio. The barcode of the radio is: 8200057681TO390. Thanks. Hi. I have locked radio in renault trafic last 4 didgits is: N541-security. Can you please write a code? Hi, my radio serial number is W394, can you help with the unlock code please. Hi, My code is M195, I’ve paid the fee, thanks.